Thirty dollars for adults, with discounts for kids. Choose bottomless Mimosas, Beermosas, or Bloody Mary for just twelve dollars more. For Easter Sunday Brunch, have a blast! Indulge in prime rib, salmon, shrimp; ham, bacon, and eggs. Build your own omelet, pancake and french toast stations. Plus potatoes, asparagus and other grilled veggies; and ice cream for dessert. 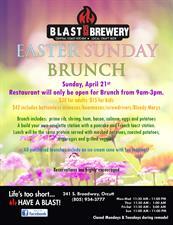 Make your reservations today at 805-934-37-77 for Easter Sunday Brunch nine 'til three at Blast Eight Two Five Brewery. Thirty dollars for adults, with discounts for kids. Choose bottomless Mimosas, Beermosas, or Bloody Mary for just twelve dollars more. Life's too short, have a blast!